People wait to get to the ferry heading towards Senegal from Gambia's capital Banjul, Jan. 17, 2017. Senegalese and Nigerian forces are gathering at Gambia's border, vowing action if President Yahya Jammeh does not does heed a call from West African leaders to step aside for Adama Barrow, the declared winner of the December 1 vote. The move comes after Gambia's National Assembly extended Jammeh’s term by three months under a newly declared state of emergency. 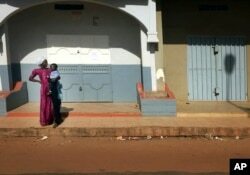 The central market in Banjul was deserted Wednesday amid a heavy police presence throughout the downtown area. A woman looks down an empty street in Banjul, in Gambia, Jan. 18, 2017. The harbor where people board the ferry to take them out of the capital and on to Senegal was packed. Port authorities said thousands left yesterday, and a steady stream of women and children were headed in that direction today with their luggage. The uncertainty centers around Thursday, January 19 the day that President-elect Adama Barrow is scheduled to be inaugurated. FILE - Gambian President-elect Adama Barrow is shown during an interview in Banjul, Gambia, Dec. 12, 2016. In Banjul, people are growing impatient with Yahya Jammeh. “He’s wrong. He already sit for 22 years. You should give other people a chance,” says a carpenter named Tijan. But Jammeh is digging in. He has condemned what he has called extraordinary foreign interference in the country's affairs. He challenged the election results, but the Supreme Court says it is unable to meet until May because of a shortage of judges. ECOWAS says Jammeh must step down Thursday. The regional bloc is threatening a military intervention. International tour groups are scrambling to evacuate tourists. Tom Laker, a Dutch citizen, was preparing to head to the airport. “I don’t actually think that tourists here are in danger, but I do see that the situation is tense enough to maybe warrant bringing people back home,” he said. 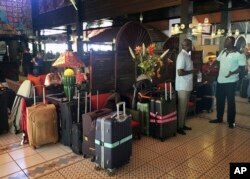 British and Dutch tourists wait in the lobby of their hotel to be taken to Banjul Airport, in Gambia, Jan. 18, 2017. In a televised statement, Jammeh said that the security forces have been instructed to maintain law and order, and that “acts intended to disturb public order and peace” are banned. The airport remains open. 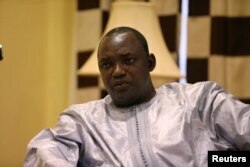 President-elect Barrow is in the Senegalese capital, Dakar. He needs to be inaugurated on Gambian soil. Barrow has insisted that will happen Thursday as scheduled, though from the looks of things here in Banjul, it does not look like it will take place here.